Love & Friendship in a Jar. A Month of Thoughtful Quotations – NEW STYLE Premium Italian Glass Jar. 31 Multi-Coloured Quotes to Show Someone How Much You Value Their Friendship. “Be The Reason Someone Smiles Today” Complete with gift box. PERFECT GIFT IDEA: The perfect gift for mum, dad, brother, sister, son, daughter, aunt, uncle, friend, teacher & colleagues……in fact the perfect gift for anyone who you just want to show how much you care and how much you value their friendship. A ideal gift for Birthdays, Valentine’s Day, Mother’s Day, Christmas, Graduation, Exam Good Luck, Secret Santa, Best Wishes & Congratulations for any occasion. A perfect gift to yourself! ADORABLE CONTAINER IN ITS OWN GIFT BOX: 314ml Premium Italian Glass Jar. BOX: 105mm x 105mm x 120mm. JAR: 101mm tall x 85mm wide. Each jar contains EXTRA BONUS Quotes. SPREAD JOY ALL YEAR: When you buy your Jar of Smiles today, you will get a GIFT jar filled to the brim with kind and humourous Quotations. Each jar is hand made and contains 31 colourful quotations in a high quality glass jar for you to pick at random each day of the month. 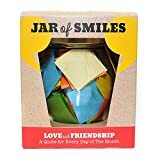 INSPIRATION & MOTIVATION: Smiles by Julie have created a range of quotation jars in various themes which contain a month’s worth of quotations for inspiration, laughter, motivation and success. Our jars of thoughtful and happy quotations are the perfect gift for inspiring someone every day, to help them reflect on daily life and to reach for their goals. Have You Ever Wished That You Could Get Love & Friendship in a Jar? Have You Ever Struggled To Buy That Gift For The Person Who Is So Difficult To Buy For? Have You Ever Looked For That Unusual Present That Will Be Enjoyed Day After Day? Our jars are filled to the brim with colourful quotes for you to TAKE ONE DAILY. They provide simple reminders and words of wisdom to inspire you towards your own dreams & successes. We hope that you get as much enjoyment from them as we did in making them. We want you to be totally satisfied with your Little Jar of Smiles. When you order today, if for any reason you feel anything less than 100% happy with your purchase, simply contact us to receive a 100% refund of your purchase. Don’t wait any longer… Click on the Add to Basket above……Show some-one how much you love them and order your Little Jar of Smiles now!